The love and passion for their music has never faltered. Re-charged and re-focused, Great White channels their raw, sweet and all-at-once dangerous sound into their soon-to-be released collection. Set to come out May 2012 from Frontiers Records, Elation is the band’s 12th studio album. 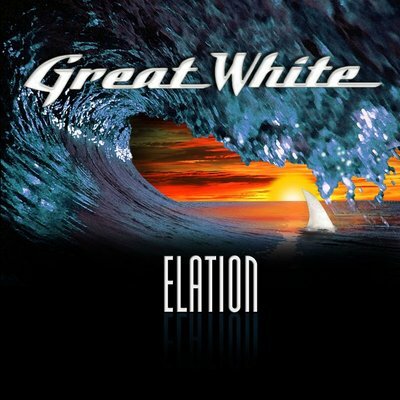 Elation thrives on Great White’s signature grit and blues-hued sound, only marked with a new synergy. Featuring original members, Mark Kendall (guitar), Michael Lardie (guitar, keyboards), Audie Desbrow (drums) and joined by lead singer Terry Ilous and bassist Scott Snyder the group emerged unscathed from late 2011 band member changes. Best known for the 1989 smash “Once Bitten, Twice Shy,” Great White’s worldwide sales are approaching 10 million. Their song arsenal also includes “Rock Me,” “Save Your Love,” “The Angel Song,” “Mistabone” and more! Lardie, who also served as Elation’s producer, applauded the band’s teamwork in the studio. He was struck by the group’s song writing approach and enthusiasm, and assures fans will embrace the record. Evidently after using Jani Lane, Paul Shorting these past couple of years, Great White have settled on the very experienced, and also very talented Terry Ilous (XYZ). As you would expect its not jack Russell singing, not many have a trademark set of pipes like Russell. We currently have 2 versions of the same band, although this is the original, and both peddling the same songs to the same audience base. Let the lawyers pick them both clean in the name of Great White! Opening track <i>(I’ve Got) Something For You</i> definitely in the old Great White blues rock vibe. <i> Feeling So Much Better</i> is decent enough and proves the bloke has a great set of pipes, but its difficult to get past the missing Jack Russell vox (maybe I’m being a bit too harsh). Ilous does a decent enough job I admit, but possibly the songs could be taken up a notch with Russel’s singing, bearing in mind he can still sing like he did of course. <i>Love Train</i> take thinks up a discernible notch or three, a slow burner in the classic Bad Company mould. <i>Hard to Say Goodbye</i> is an obligatory campfire cowboy rock ballad that sounds as its straight out of the Black Crowes back catalogue. Tracklisting:(I've Got) Something For You; Feelin' So Much Better; Love Train; Heart Of A Man; Hard To Say Goodbye; Resolution; Shotgun Willie's; Promise Land; Lowdown (Bonus Track); Just For Tonight; Love Is Enough; Complicated.